The setting of the Euroleague Final Four Fanzone in Madrid is mightily impressive, sitting in one of the most historical sites in the beautiful capital city. 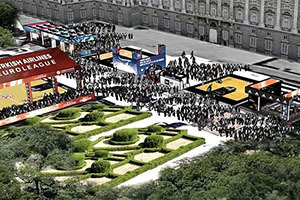 The Royal Palace serves as the stunning backdrop for the event but the people who have flocked to the Faznone are more focused on the basketball and the buzz that follows this style of event. Even by the close of Saturday, the organisers were convinced that this has been one of the biggest and best Fanzone events yet, with an estimated attendance of 120,000 fans showing up for the fan area. With the attendance count for Sunday still to come, there is no doubt that the Fanzone is one of the most important tourist attractions in Spain, never mind just Madrid, this weekend! The Fanzone opened to great acclaim and fanfare on Friday and the people kept on coming. At all hours of the day and evening, there was a buzz of activity and there wasn’t an empty bit of land or court where basketballs weren’t being bounced and enjoyed. If you are the sort of person that loves the swish of the net as the ball flies through the air and into the basket, this was the place for you this weekend. The Plaza de Oriente was laid out with kids in mind but there were plenty of big kids enjoying the action that was taking place. Basketball was the main focus but there were also entertainment areas with plenty of live music and tunes pumping over the PA system. Music plays a big role in ensuring a crowd is enthusiastic and the crowd at the Fanzone seemed to love the energy and vibe from the place. There were also plenty of Euroleague stars of past and present on hand, which was a tremendous addition to the Fanzone. Fans want to see their heroes and with four current players, representing every team in the Final Four, attending the Fanzone on Saturday, there was a great deal of excitement with long queues of fans waiting to meet their heroes. While the Fanzone was happy to welcome everyone, basketball fans and non-basketball fans alike, there was a lot to be said for the colour and energy shown by fans of all four teams. Even if Friday night didn’t pan out in the way that some fans were hoping for, all four of the teams were well represented on Saturday. The third and fourth games may not mean a great deal, but the fans who lost on Friday night looked to be up for a second chance of glory on the Sunday. This sort of weekend event provies everyone with a second chance of success, and while most of the focus falls on the final which takes place later tonight, the third and fourth game is a big part of the Euroleague Final Four weekend. We may be nearly at the end of the Euroleague Final Four but the memories of the Fanzone will live on for a very long time.